Corporate competitiveness is a process that requires continually adjustment to the market to increase efficiency and effectiveness. A paper by Bhattachariya and Gibbons (1996), discusses in further depth how this environmental alignment can be achieved. By ensuring organizations are structured in a way that improves competitiveness, they can also help secure a place in the global economy. Greater internationalization, consumer choice, fragmented markets, and short product cycles are some of the challenges organizations face. Companies increasingly are forced to change with environmental demands and are attempting to do this through transformation of their structure. A proper transformation should align the organization and everything within it to corporate strategies that match the market environment. Two primary constraints influence businesses, which include the external environment and a level of performance that is sufficient to deal with that environment. To find the balance means one must find a strategy that positions the organization into a competitive stance. That strategy is a way to achieve an objective; it is a path to a goal. 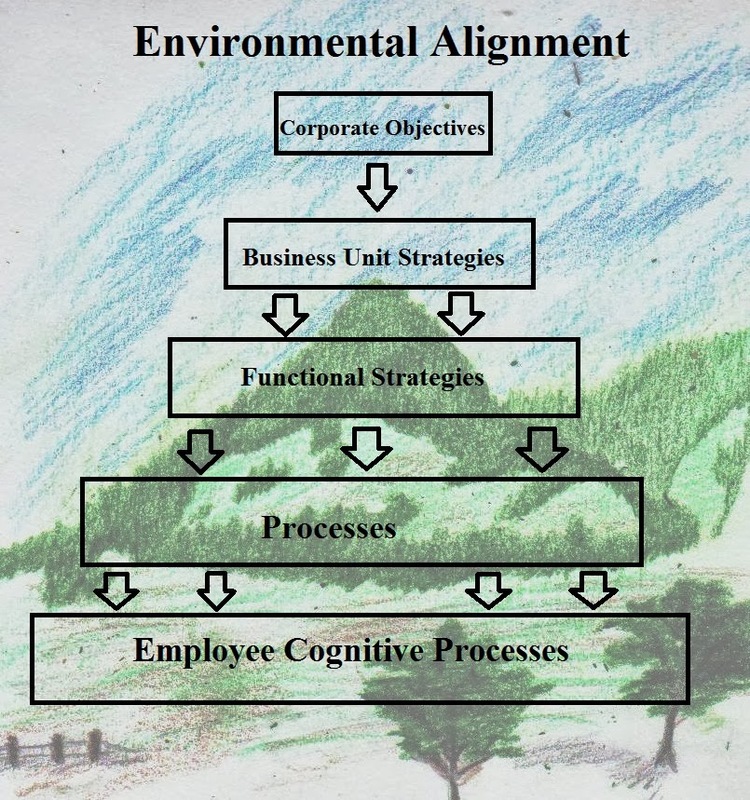 The external environment is the environment, which the organization is currently working. It may be global in nature, could include the local labor market, or focus on regulatory environments. It is all of the pressures and factors found through a proper environmental scan. The performance level of the organization should be able to compete effectively in that market if there is to be success. The entire structure should be aligned to the environmental needs. This requires the ability to ensure processes and procedures are fulfilling the organizations functions. If these processes and procedures do not fulfill a competitive need or are not aligned to the market, then it is necessary to reduce them as waste. Each strategy should focus on what the organization does well. If innovation is a core competency, all processes and procedures should align to the environment in a way that further enhances these abilities. For example, innovation would require a level of experimentation, collaboration, flatter organizational structure, and open-minded management, and constant communication. The organization should seek to develop processes and procedures that enhance this innovation to compete in an environment with lower product cycle times and competitive offerings. The author does not discuss cognitive processes. As processes and procedures are learned employees naturally begin to change the way they think about proper work functions. The longer such processes and procedures are used the more they become embedded within the organizational culture and the mindset of the employees. To have a truly transformational change requires the changing of thoughts and behavior. -Adjusting organizational strategy to match environmental demands. -Adjusting business unit (departmental) strategies to match organizational strategies. -Create functional strategies that are in alignment with the departmental and corporate strategies. -Adjust processes to fulfill the functional strategies, departmental strategies and corporate strategies. 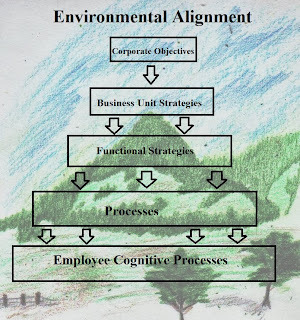 -Encourage new employee cognitive and behavioral strategies that match the needs of the processes, functional strategies, departmental strategies, business unit strategies and organizational strategies. Bhattacharya, A. & Gibbons, A. (1996). Strategy formulation: focusing on core competencies and processes. Business Change & Re-engineering, 3 (1).